Traditional Vietnamese cooking is greatly admired for freshness of the ingredients and for the healthy eating style. The Vietnamese have a strong vegetarian tradition influenced by Buddhist and Chinese values. Enjoy a home cooked meal, visit markets where you will learn about Vietnam’s fresh staple ingredients and tour Hue. The cooking art of Hue is famous for its refinement and artistic quality. Even the simplest meal has an elaborate presentation. Enjoy a cooking class at a culinary art school in Saigon. Culinary Vietnam gives you a keen insight into Vietnamese culture through the universal art of preparing food. Arrive in Hanoi where you will be met and driven to your hotel. Late afternoon tour the French Quarter. Enjoy a welcome dinner at Club de L’Orientale, a deluxe Vietnamese restaurant offering authentic Northern cuisine. The Chairman of the Hanoi Gastronomy Club and the editor of Culinary Art magazine will join you and give an introduction to Vietnamese cuisine. Early morning you will be met by member of Hanoi Chef Association for a market tour. You will then be driven to his beautiful private home for a private hands-on cooking class and stories of his participation in Culinary Festivals in France. Enjoy your own creations at lunch. Return to town for a city tour including a visit to the Temple of Literature. Dinner is at a local rustic restaurant Cha Ca La Vong, famous for its single dish of grilled fish served in boneless chunks, smothered in greens and saffron-infused oil. 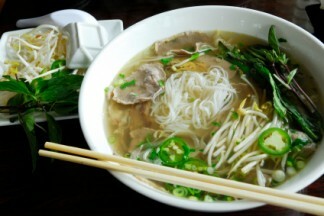 This morning, enjoy breakfast Pho Vuong Restaurant for a bubbling bowl of Pho accompanied by coriander, bean sprouts, onion and either beef or chicken. Drive to Ha Tay province famous for its pagodas, temples, communal houses and handicraft villages. Today, you can see the real portrait of Vietnam’s countryside and how traditional crafts and practices are maintained for generations. In the evening, visit the house of a musician couple – the husband is a flutist in the National Orchestra while the wife is a piano teacher – for home-cooked dinner. After dinner, enjoy a melodious performance of flute and piano. Drive to Halong Bay. Board your private deluxe junk for a delicious seafood lunch while cruising through the magical bay. See the thousands of sculpted limestone islands rise from the waters like dragons’ teeth. Later in the afternoon, visit a fishing village. At sunset, journey by a bamboo boat to discover a water tunnel with coral reefs in a scenic lagoon. Back on board for dinner. Watch an early sunrise on the bay and enjoy a Tai Chi demonstration on the sun deck. Visit the splendid Sung Sot Grotto where stalactites hanging from the high ceiling take on numerous shapes and forms. Enjoy late buffet brunch on board while cruising back to the boat docking station. Arrive at the boat docking station around 11:00AM. Drive to Hanoi with a stop at Dong Trieu village, one of one of the last survivors of an old pottery village, then onward to the airport for your flight to Hue. Stroll about the Dong Ba market with a local chef where vegetables and meat are on wholesale and learn about Hue recipes and ingredients. After the tour, transfer to Ancient Hue restaurant, a beautiful complex of ancient houses for a cooking class and demonstration of Hue specialties. Try your own creations for lunch. This evening you will dine in a restored royal house where you can learn from the family members how they bring the essence of the Royal ambiance and culture into their home. Today visit the elaborate Khai Dinh Royal Tomb where architecture and atmosphere showcases influences from both eastern art and western designs meet. Join monks in their tea ceremony at an ancient pagoda followed by a vegetarian lunch. Take a scenic drive over the Pass of the Ocean Clouds to the ancient town Hoi An. This morning you visit Tra Que vegetable village to watch the farmers prepare the land and learn the local form of fertilization using seaweed from the local lake. A private home-cooked lunch offers numerous local delicacies including “Tam Huu” spring roll. Afternoon enjoy a walking tour of Hoi An. The narrow lanes are ideal for walking to visit the old merchant’s house with influences from Chinese, Japanese and Vietnamese architecture; the 400-year-old Japanese Covered Bridge; the Assembly Hall of the Chaozhou Chinese Congregation with outstanding wood carvings. Dinner is at the charming Full Moon restaurant. Transfer to the airport in Danang for your morning flight to Saigon where you will be met and driven to your hotel. Your walking tour takes you passed Saigon’s historic landmarks including a stroll down Rue Catinat of Graham Greene’s ‘The Quiet American’, the Opera House, a three-story classical theatre built to entertain the French colonists (outside visit), the former Hotel de Ville constructed for the French bureaucrats of Indochina in 1901, now The People’s Committee Building and the Notre Dame Cathedral, a stunningly massive red-brick edifice with twin spires, a clear reminder that French once ruled this city. This evening you have a private cooking class at the Saigon Culinary Art Center on typical Southern Vietnamese dishes, followed by a dinner that you have cooked yourself. Explore My Tho, a charming city in the Mekong Delta. In My Tho, board a private motorized boat to cruise along upper Mekong and observe the abundant agricultural life. Visit a fish-rearing village before entering Vam Xep canal with its beautiful water palm scenery. Disembark and stroll around Quoi An. Enjoy traditional music in Ben Truc. Your Farewell dinner tonight in Saigon is at the former residence of Henry C. Lodge, the US Ambassador to Vietnam in the 1960’s. Enjoy a candlelight dinner and a violin and piano performance.